Getting To the Finish……..How Much Pizza Should We Get??????………. Hello once again friends of old and strangers from distant lands. 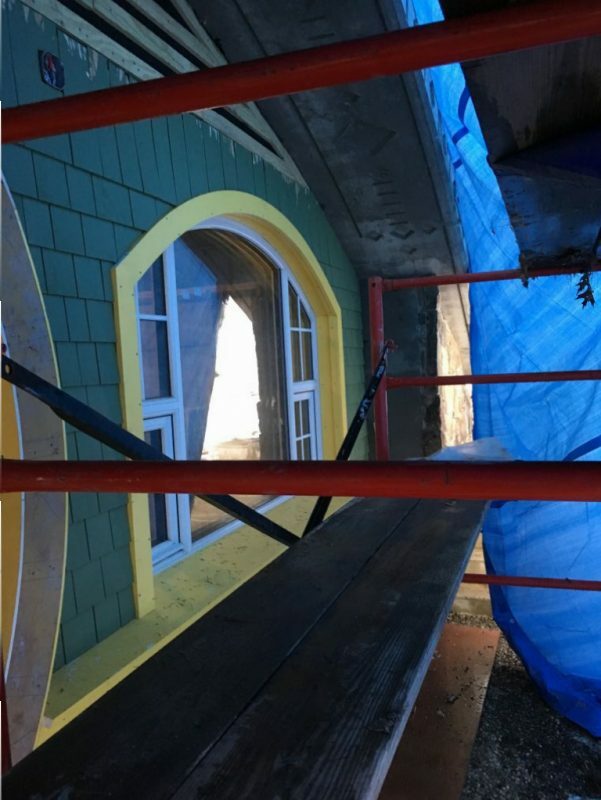 So glad to have you all back for another edition of the Hobbit Hollow construction Blog! Hmmm. A wise old sage the boy is isn’t he? Or as they say in the Bronx a wise a_s! Just take a moment to fill in the blank there. If you’re having trouble the middle letter is an s. It’s always annoying when people point out the truth. There really is no argument there. He’s right. I would say, in my defense, that the last three years at work have been pretty stressful and tiring. It’s a poor excuse but an excuse nonetheless. Really what you need is time. Time is not a commodity so easily purchased. And to be quite frank the house has been a lot more difficult to build than I ever really anticipated. So. What to do. Well we have finally had a break in the action in Manhattan and I talked to my boss about taking some time off to finish this epic house that I’ve been working on for the past 7 years. And he said okay. And so it begins. 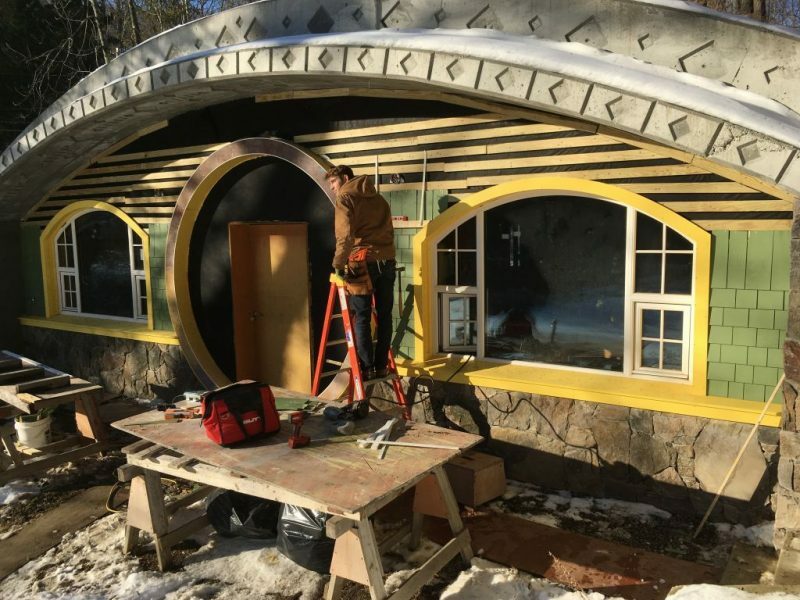 The final push to finish the Hobbit house. The beginning of the end. So there are approximately a million little things to do. And about a million little stories I could tell you about since I started working full time over at the Hobbit. Just a quick one for starters. So I’m working over at the Hobbit and nature calls, if you catch my drift. So that mother-in-law of mines house is literally 60 seconds away. So off I go. After I’m done she asks me if I want a cup of coffee, which at the time sounded like a great idea. She has a Keurig so it’s not like she has to get a mortar and pestle out and grind the coffee by hand. So me being a sweet guy I ask. Do you have any sugar? Sure she says right in the sugar bowl. Of course I go to the sugar bowl and the thing looks like it’s never been used. Not even a grain of sugar is in this thing. So she goes to the pantry to get me sugar. 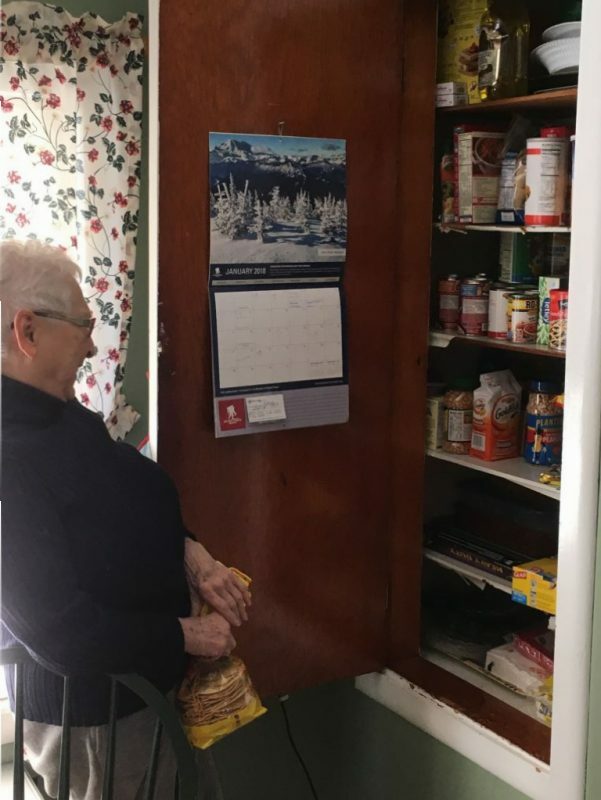 My mother-in-law looking for the sugar in her pantry closet. Oh! Here’s the sugar!” she says. And proceeds to hand me a bag of flour. And this is all true people. She does this three more times!!! There I am with my black coffee and four bags of flour. Now this is where it gets interesting. She goes to another closet and gets one of those miners lights that miners wear on their hard hats so they can see in the dark,straps it to her forehead and starts to crawl into the back of the pantry looking for the sugar! It doesn’t look possible from the picture I know but that’s what she did. The sugar was so far back in the pantry that she actually lost her footing and all you could see were two little legs sticking out of the closet!. I had to pull on her legs to get her out of there! 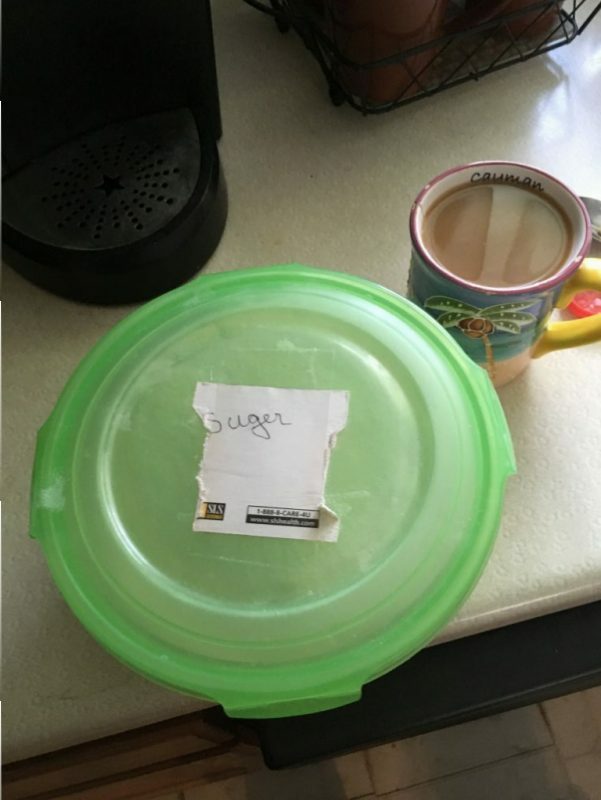 She did get the sugar though. It was one of those moments when you’re thinking “Am I going to have to call 911 to help me get this woman out of here?” Moral of the story…..get a toilet in the Hobbit house as soon as possible. That really happened people. No joke. This is what she pulls out of the pantry. So there really is too much to go over in one sitting so I’ll just give you a bit of a run down on whats been going on. It’s longer than usual. 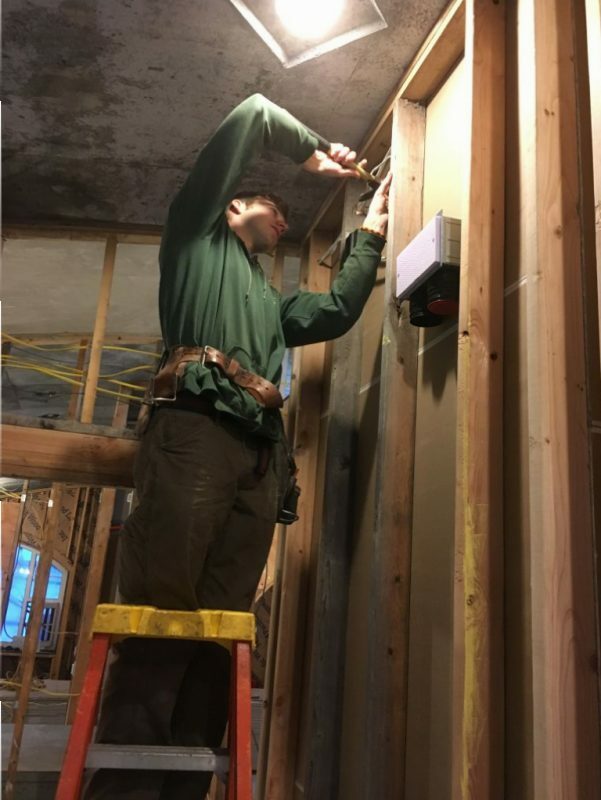 I’ve been working on the electrical and plumbing for the last two weeks for the most part. It was great because it was bitterly cold out for quite a while in the Northeast. So even though the boys were home on their college winter break they weren’t able to help all that much. Jude couldn’t help at all because of the treatment he was having for his staph infection. (Intravenous antibiotics 24 hours a day for 14 days.) The plumbing is a slow process with a lot of thought going into putting the puzzle together if you will. It was actually a lot of fun. During this time when I was nearly done with the electrical and plumbing I went to order the kitchen cabinets. I’ve done a few kitchens over the years and this one woman over at HG Page is an ace. She takes one look at my design and says. “This is not going to work.” Great. So in order to make things “work” I had to move a whole bunch of stuff electrical and plumbing wise. This was mainly because I had the frig adjacent to the wall and the door wouldn’t open properly if it was next to the wall. She also moved my dishwasher and my range to make everything more user friendly. On top of that the vanities that I had planned for the bathrooms were not what’s typically done as well as the lighting around the vanities. So there was definitely more than a days work fixing all that stuff. I think it was well worth moving everything. Oh. Almost forgot. The plumbing supply lines, hot and cold water, I used the PEX pipe. What a dream to use. So quick and easy. 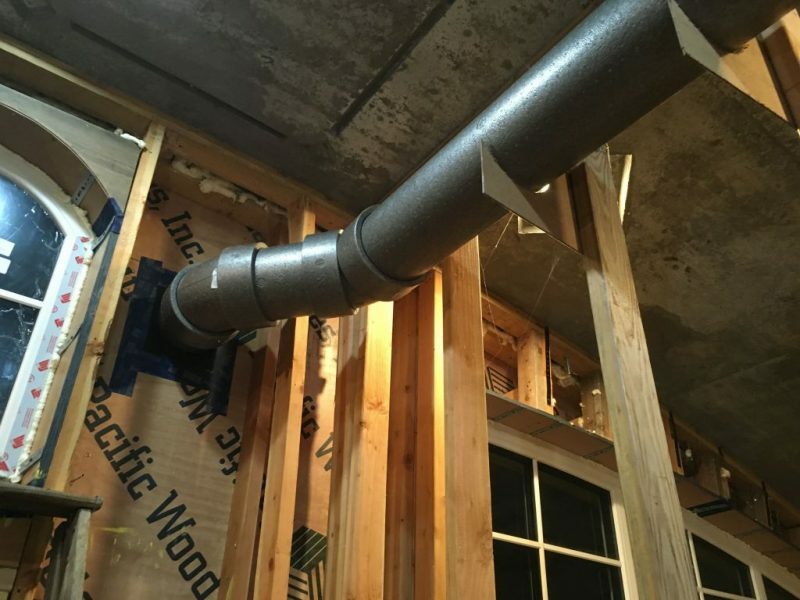 You use clamps and a crimping tool to connect all the pipes and fittings. I also used these “Shark Bite” fittings and valves to make a bunch of other connections. “shark bite” are push to fit. You just push them into the piping and you’re done. No cleaning fittings, brushing flux and soldering. I cut at least two days off the install using this stuff. It was great. 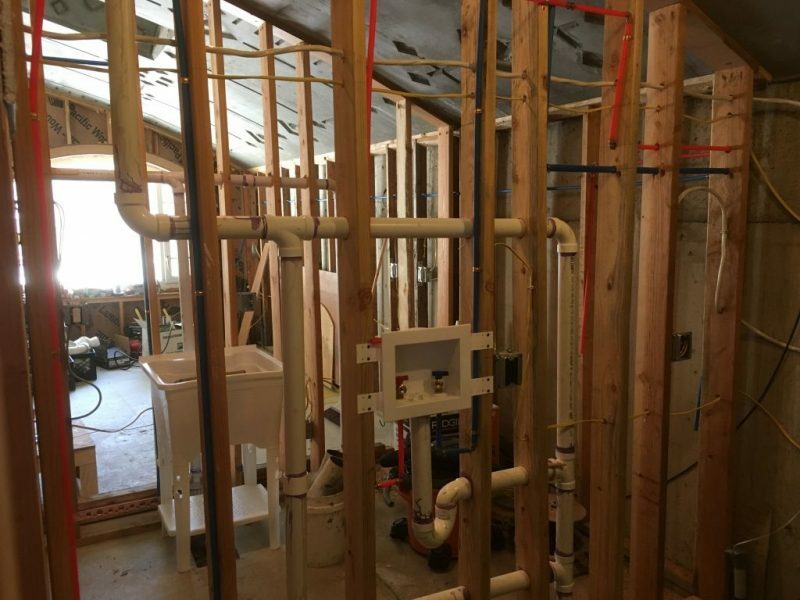 Getting the plumbing done.Note the PEX piping. I also started getting into the HRV (Heat Recovery Ventilator) I set up some of the supply and return vents the other day as well as the incoming fresh air supply. check it out. HRV supply temporarily supported so we can insulate the outside walls. So I needed to make this connection for the insulator. 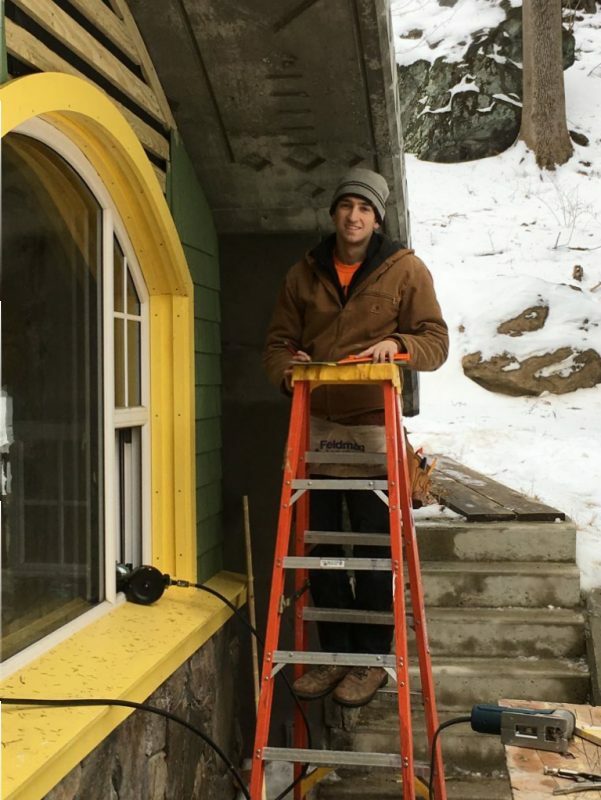 He’s coming over this Wednesday to insulate the front and back of the house with open cell spray foam. He’s also going to insulate a number of interior walls as well for sound proofing purposes. 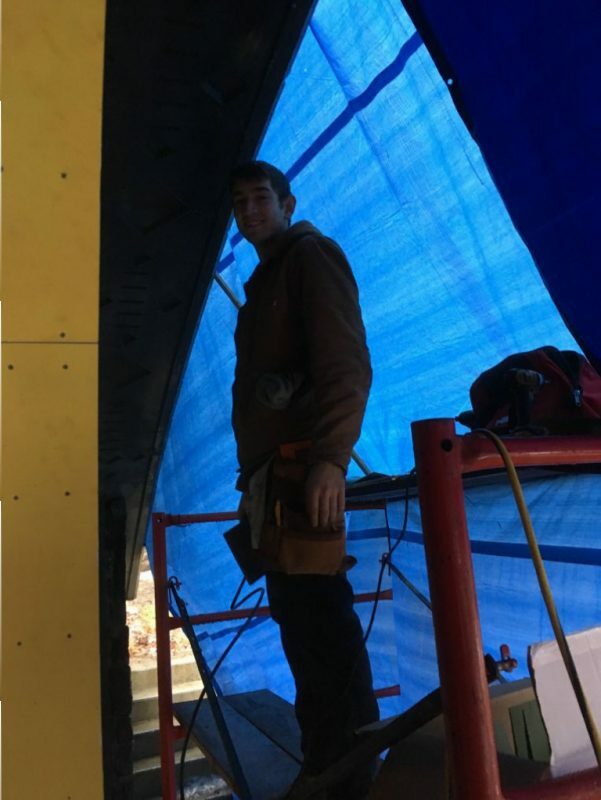 I originally wanted to use dense pack cellulose for the exterior insulation but the insulation guy said the dense pack will be hard to get into the nooks and crannies around the windows. Also there is the possibility of the insulation settling on the high wall areas. 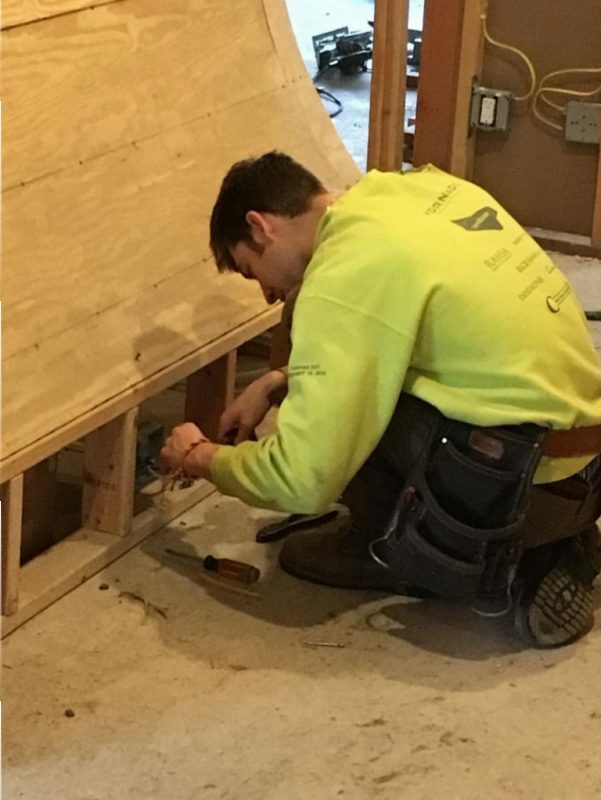 He said I would have to install plates between the studs every four feet to ensure that the cellulose wouldn’t settle. So it will be interesting to see their operation come Wednesday. Just a few pictures and comments to finish out the blog. 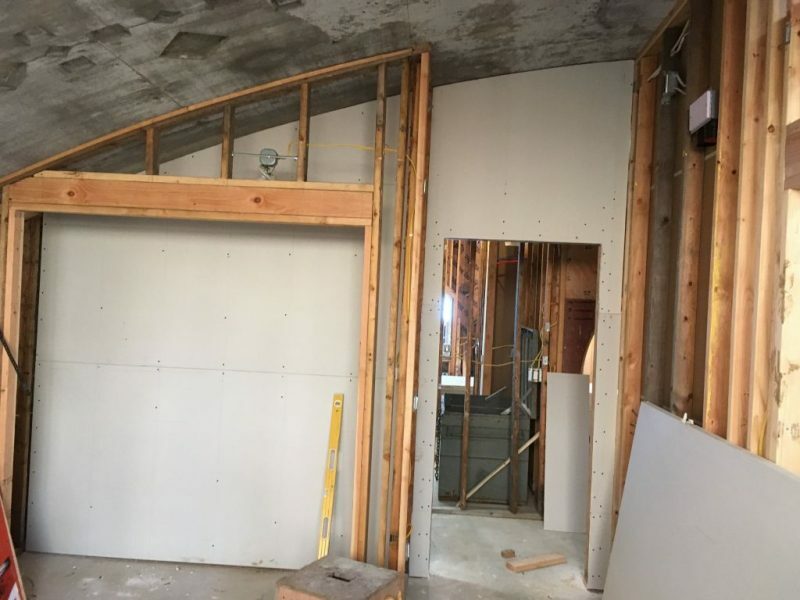 Started a little drywall the other day. Everything has to be cut to fit on a radius. Sheet rocking the house is going to be a slow process. Just because most of the sheets have to be scribed to fit is all. Ethan adding an electrical outlet in the circular hallway. The electrical inspector wanted a couple of things done in the house. One of which was adding an outlet in this hallway. Another thing he mentioned that was new to me was that the dishwasher line has to be an outlet that is in the cabinet where the kitchen sink is. Also all of the bedroom circuits must be protected with arch fault breakers. That’s a new one as well. I also need a GFI outlet within 25 feet of my mini split heat pump on the roof. Like I said, a lot of little things. Ethan wiring for the smoke alarms. The electrical inspector also mentioned that the smoke alarms have to be hard wired on their own circuit. One in each bedroom and a smoke/carbon dioxide detector in the hallway. If one detector goes off they all go off. Pretty good idea. Jude uncovering the entrance to the septic. So I had the plumbing inspector come over Thursday to do an inspection on the vent system and the supply system. So way back when I had a water test done on the under slab piping before we covered it up with gravel. Unfortunately the inspector wanted another pressure test done on the system. Which I wasn’t ready for. The problem is I have to plug the end of the system in order to pressurize it. 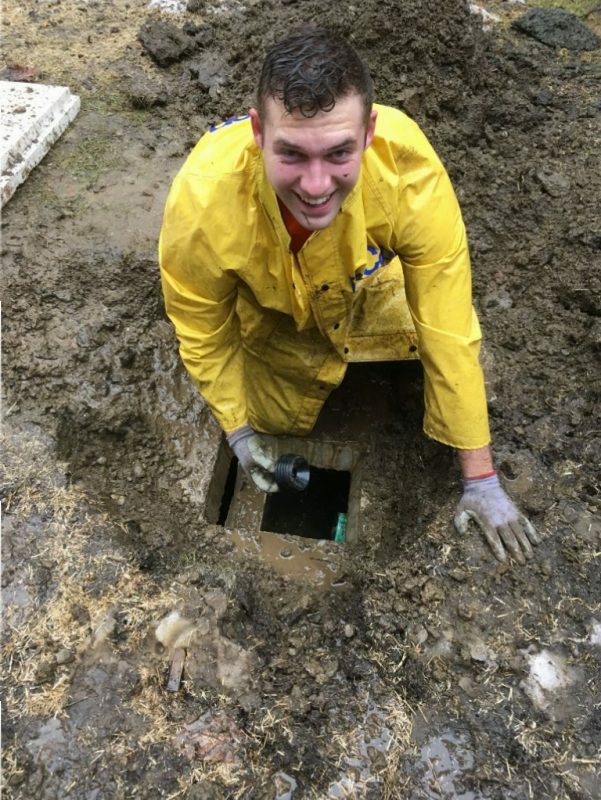 Which means we have to plug the pipe that goes into the septic inside the septic. Only problem with that is that the ground is completely frozen over the septic. Luckily I had some extra styrofoam that I used to cover the septic with to thaw out the soil. So Friday, believe it or not the temperature hit 54 degrees and rained torrentially all day. I had Jude remove the styrofoam and uncover the entrance. It’s another long story in which we had a couple of false starts but we finally got the water into all of the lines. 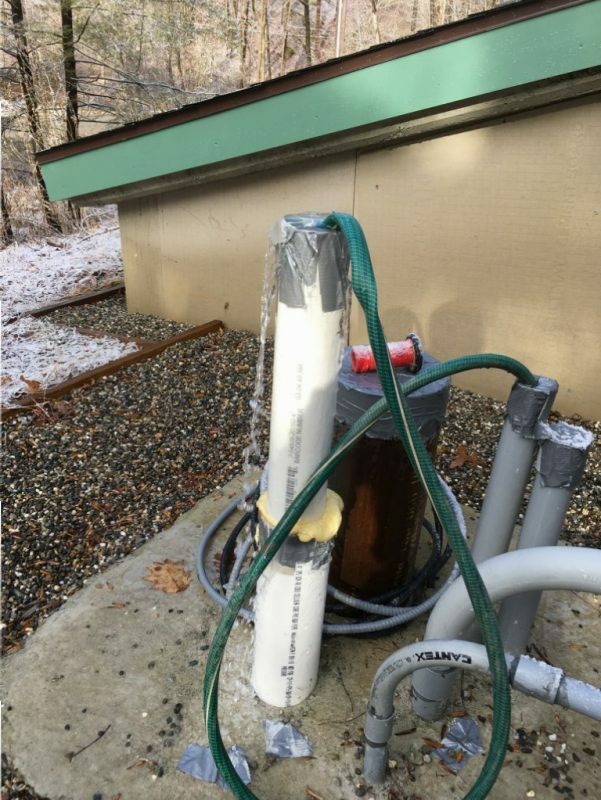 I ran a water hose up to the roof and put the hose into the 3 inch vent stack and turned the water on until it came out of the vent pipe at the top of the house. Check it out. Water test on the vent/drainage system of the house. 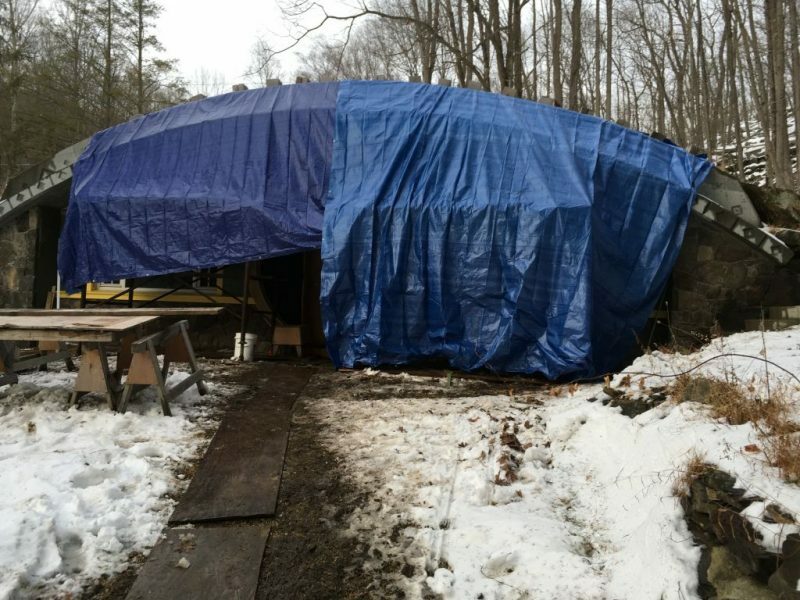 The tarping of the front of the house. We tarped the front of the house so that Terence could work on the siding during the rain on Friday. It turned out to be a great idea. Terence working on the siding during the rain. Siding coming along quite nicely. 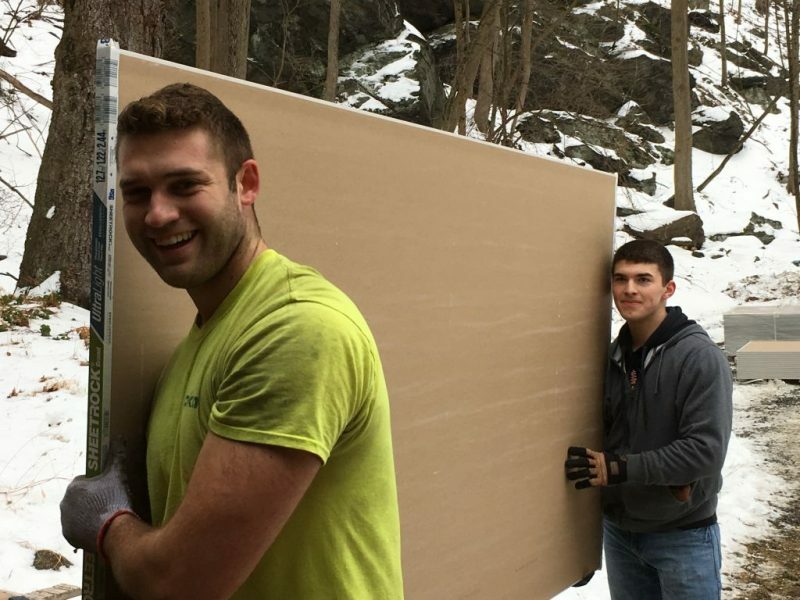 Drywall delivered and unloaded by Jude and Paul. Ethan helped with the 4×12 sheets. 120 sheets delivered. Terence working on the siding. A very technical job I might add. The curvature of the roof and the windows pose a special problem. Like I said there’s a lot to go over. I know this was really long but just one more story before we go. So the other day we went over to my sister in laws for pizza. There were eleven of us. How much pizza should we have gotten? I looked at my father in law and we both came up with 4 pies. Eight slices per pie gives you 32 slices, divided by 11 people gives you 3 slices per person and we all know that the Editor and my sister in law are only going to have one slice. Simple math. (And there will probably be a couple of slices left over. )That would leave 4 slices for the big eaters like my three sons. So “they” go to order the pizza and I hear my wife say “Lisa come here!” In my head I’m thinking these two are up to something. They order five pies to our surprise. Did you ever hear the story of Jesus and the five loaves? Well basically there was this huge hungry crowd of ten thousand and Jesus asks for whatever food they have which is about five loaves of bread. He blesses the loaves they pass them around and when all is said and done there are tons of baskets of bread leftover. Guess how many slices were left when we finished? Twenty three. Probably could have fed the ten thousand. I’ve never been involved with a pizza dinner where there was that many slices left over. Unbelievable. Simply unbelievable. Turns out there were a lot of people in that crowd who didn’t tell Jesus they had bread. Or one of the apostles ordered way too much bread! Happy New Year!!!! !……….Where Were We????? Wednesday for a cup of coffee. Do you know what a lucky guy you are? look at those boys helping you get that house done,and how handsome they are,gee I see a lot of me in them. Well some how I knew you would make a blog of the sugar incident,your lucky if you ever get another cup of coffee here again. As far as pizza I hope to never see another pizza box ,thanks to Terence and his friends it all got eaten,well I don’t care for store bought pizza I like my own home made so I won’t miss it. I have to say the house is really looking great,keep up the good work,even though you lost 2 of your guys you still have Ethan.